Next Generation Schools will be built on a sustainable business model. That means we’ll do business differently. We estimate that teaming up to purchase supplies could save schools 15-30% on those purchases. This model can be used for purchasing goods as well as services such as maintenance and construction. This is just one way Next Generation Schools will do business differently. By teaming up with local organizations, Next Generation Schools will avoid costly duplication of services. For example, the regional education system will work closely with family services to ensure that students are getting the support services they need. It is estimated that if students moved through the levels of education sooner - both academic and social/behavioral skills have been mastered - the cost savings could be more than $19 billion nationally. Inventors, foundations and entrepreneurs have made headlines nationwide for their investments in education. Likewise, CESA 6 hopes the Next Generation schools initiative will attract venture capital for new initiatives and projects. It's easier to understand an agenda with a picture. A picture is worth a thousand words. The following graph was used in a power point presentation about how the Innovation Lab Network will change and redesign how American schools will function in the future. This is a 'Race to the Top' education model. The graph was taken from a power point presentation from the Stupski Foundation, the OECD, the international Organization for Economic Co-Operation and Development, with a grant from the Chief State School Officers, CCSSO, about the Next Generation Schools, called the Innovation Lab Network. These are the original states that are included in this pilot research project from Obama's 'Race to the Top' -Maine, West Virginia, Wisconsin, New York, Kentucky, and Ohio. Race to the Top was funded from the Recovery Act with $400 billion dollars. Since that time waivers have been given to states that need flexibility in using their Elementary and Secondary School Act (ESEA) funding In the "No Child Left Behind" legislation to move toward this model since the current Congress has not passed a budget. More states are involved at this time. The most profound concept in this graph shows how the next generation school will eliminate representative government. Notice that the new system bypasses the community, governance, and finance. Draw your attention to the blue lines that are most important to this agenda. They are: your child, called human capital, assessment which is testing, technology, and any time and any place. Testing and technology become the most important part of this agenda to create the human capital of the future for the international global workforce. How will abolishing representative government work? In order for this graph to become a reality, there are three barriers that must be removed. Community; families, parents, and churches must have no options or legal authority, only a choice of which school to send their children; Governance; your locally elected school board or other elected local or state officials that could become a hindrance will be eliminated or reduced to minor functions: parents will not have any voting power over a for-profit charter school; Finance; the neighborhood school no longer depends on your local tax base to fund schools under equality or leveling the field. The mantra that will be quoted is, under fairness and equity there should not be rich school districts or poor school districts, only schools. Your tax money will be pooled regionally or toward a county base to be distributed equally for each child. Federal funds will now fund individual students. 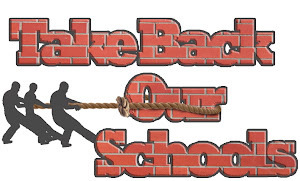 Your elected school boards will no longer have the tax base from which to run their school. Your local neighborhood school will eventually be pushed out through academic bankruptcy and/or taken over by charter schools. 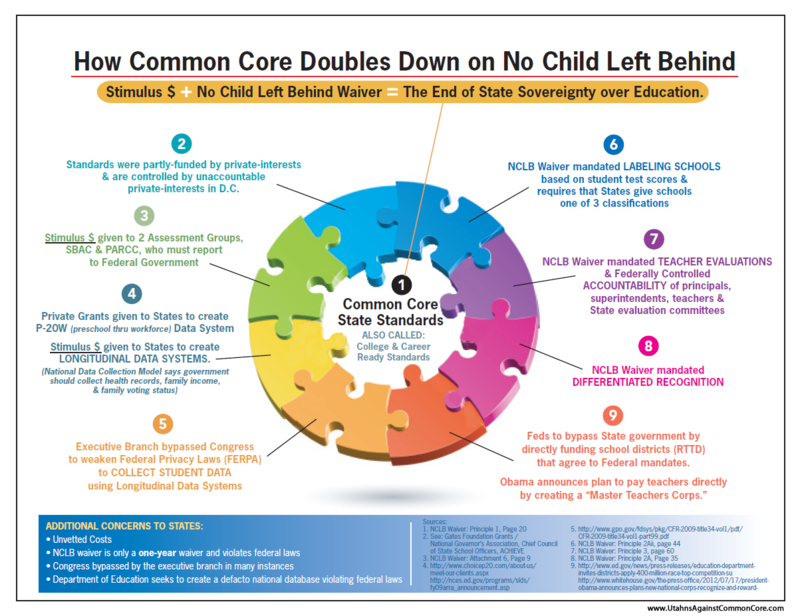 Do you think Governor Jay Nixon and Commissioner Chris Nicastro had an idea that CCSSO, a private trade organizatio that we were told crafted a "state led" initiative (Common Core State Standards), actually is giving out grants to do away with any state authority over schools? Would that be a surprise to them? Would it surprise them the grants are actually from Federal stimulus money? Why is the CCSSO giving away federal money and informing portraying itself as being state led? Could the CCSSO be an organization actually crafted by private interests and funded by federal dollars to establsh a public/private corporation to eradicate representative government and representative decisions on public education? If in fact this is the intent and the adoption/implementation via Common Core makes such a scenario possible, then the Governor and Commissioner should rescind the MOU the signed with Smarter Balanced Assessment Consortia immediately. This is the new model for school choice. Federal monies, ESEA Title I, is being changed in new laws being proposed that will follow the individual child and the Individual Disabilities Education Act (IDEA) will change the definitions of who can receive funds to include any child not meeting Common Core Standards (CCS) in an Individualized Education Program (IEP), individual education plan similar to the special education plans for handicapped children. This will mean ANY and EVERY child can receive choice money to go to the school of their choice. The entry point solutions are the end results or the child meeting government Common Core Standards and what must be done to achieve these goals. This is a design down program, start with what the government wants and work backwards....what a child will know, do and be like, or beliefs, values and actions....Blooms taxonomy, the whole child theory. This graph from the Next Generation Schools, Race to the Top agenda, spells out how to mold the child toward those objectives. It shows how representative government, as well as parents, will be erased from any authority in educating their children or how the schools of the future will function through a computerized monopoly of selected profit making corporations, otherwise known as corporate fascism. This is the model for for-profit Charter Schools that use public taxpayer funds with no elected school boards or taxpayer accountability and this is the model for the takeover of all education in America including private schools. Private schools are included because, when these stipends are given to each child under Choice from Title I which is being proposed in the new ESEA legislation in the federal budget supported by Republican Congressmen and Senators, Republican governors and unknowingly by many conservative groups, any child accepting that federal stipend to go to a charter, private, Catholic, Christian, home school, or other school, will be mandated under accountability, to take federal testing to meet the federal standards. Many tests are being aligned to the Common Core Standards using federal objectives from National Assessment of Educational Progress (NAEP) test item banks already validated to meet government goals. Inevitably this will control all education in the United States if you take the money. The CCSSO has had model legislation waiting in the wings for years. Perhaps we can ask why Governor Jeb Bush is in Maine pushing his Charter school agenda with his ”Foundation for Excellence in Education" that is widespread in Florida? Legislation in Michigan, under Republican leadership, House Bill 6004 and Senate Bill 1358 would expand a separate and statewide school district Education Achievement Authority (the EAA) overseen by a governor-appointed (unelected) chancellor and functioning outside the authority of the State Board of Education or state school superintendent. These schools are exempt from the same laws and quality measures of community-governed public schools. The EAA can seize unused school buildings (built and financed by local taxpayers) and force sale or lease to charter, non-public or EAA schools. This is proof that there is some truth to an agenda of eliminating representative government. Contact Senator Lamping regarding SB 210 and thank him for his amended bill requiring Commissioner Nicastro to appear at eight town hall meetings to talk about Common Core standards to taxpayers. Contact the Senate members and urge its passage so questions can be asked why DESE signed on to standards/assessments that had not yet been written and if the Commissioner is concerned about the CCSSO funding of programs that take away state/local authority of education. Does Commissioner Nicastor agree the takeover of public schools is accelerated via Common Core standards? If she agrees with that premise, would she be willing to withdraw Missouri from the SBAC consortia and the MOU signed by Nixon and Nicastro? [L1]The direction/development of Missouri education is now handed to choice architects. These choice architects have evolved into the NGA and CCSSO, both private trade organizations. The idea that people are “free to choose” means the state has to comply with the CCSSO rules and means little to no “choice” by the “people”. 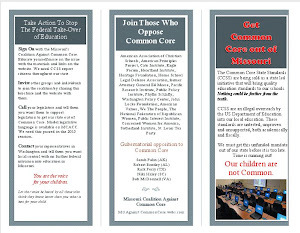 If you are against Common Core State standards, you may sign a petition to submit to the Legislature here. And Yet Another Teacher Says "Enough"